The audience gradually quiets as the first strands of music drift across the ice rink. At that moment, their attention is captured and held spellbound by the performance happening on the ice. Sixteen skaters in brightly colored dresses glide across the ice, completely in sync. The audience’s focus never wavers as the blur of color on the ice forms different shapes and complex formations. From time to time they break off into separate groups or pairs to perform intricate spins and lifts on the ice. Their movements seem effortless as they move to the music in unison. As the last strains of music fade away, the audience remains silent, savoring the feeling of awe. This is synchronized ice skating. Ayano Endo, a sophomore at Glen Rock High School, has been ice skating for ten years, beginning with figure skating at six years old and then continuing to synchronized ice skating at the age of ten. Her interest in ice skating began with group lessons with two of her friends at the Ice House in Hackensack. When her friends quit after a few months, Endo decided to continue skating. It was another four years before she would join the Synchroettes and develop an interest in synchronized skating. Glen Rock MS sixth grader, Ayano Endo, a dedicated figure skater who fractured her ankle in April, 2010 competed in Boston Synchronized Skating Classic on January 22, 2011. Her Synchroettes team skated to the songs of “Jail House Rock” and “Blue Suede Shoes”and received a gold medal. Nearing the entrance of the cafeteria, the low hum of voices can be faintly heard. Through the double doors on the left is the section for the high school. The smell of cafeteria food permeates the air. The cafeteria is always crowded with people, students of all grades sitting on the stage, or on a bench at one of the many lunch tables. Some are animatedly chatting with their friends, while others have their heads down, reading, on their phones, or finishing last minute homework. 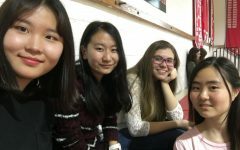 Among these students is Endo, who usually buys lunch in the cafeteria and can be found sitting with her friends at her usual table. First chatting with Endo across the lunch table, she seems quiet but gradually, as the conversations turns to figure skating, she has a lot to say. 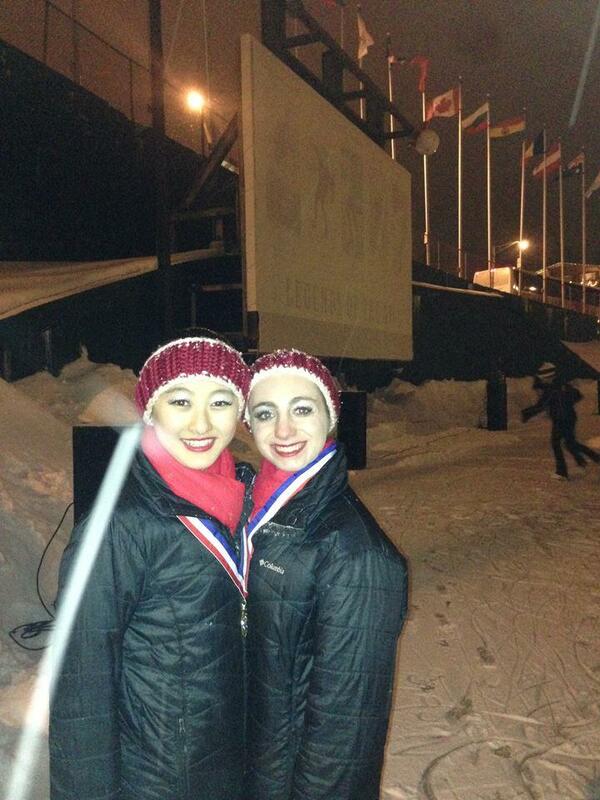 Endo is currently one of the twenty members on the Synchroettes Junior Team USA. The Synchroettes is a large organization based out of West Orange, New Jersey consisting of ten levels, with junior being the highest. Usually, skaters begin synchronized skating as members of one of the younger teams and work their way up. Each year, in April and May, tryouts are held to determine who is qualified to move up to the next level. Ayano began in the category of Preliminary in 5th grade, Pre Juvenile in 6th, Intermediate in 7th, and Novice in 8th and 9th, making it to the junior level as a sophomore. Synchronized skating can be thought of as a team sport. Sixteen individuals work in tandem to form different shapes and skate in many unique formations. Like all sports, synchronized ice skating demands consistent effort, hard work, and dedication. With both the elements of sports and dance, it requires good coordination, balance, flexibility, strength, and, most importantly, teamwork and communication. 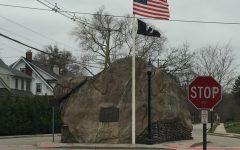 The Richard J. Codey Arena at the South Mountain Recreation Center in West Orange, New Jersey is home to the Synchroettes. With two separate rinks, the center is a bustle of activity. A blast of warm air greets patrons as they step through the front doors. Past the ticket booth and behind the first door to the left is where the Synchroettes can be found practicing their skills on the ice and rehearsing their routines. Ayano and Becky on the Olympic Oval during the 2015 Eastern Sectional Championships in Lake Placid, NY. Rink 1 is the largest rink at the center. On busy afternoons the rink is loud, the air filled with laughter and the clamoring of voices. Slightly colder than the outside, it is bright and airy, illuminated by light filtering through the dome shaped roof. Lights hanging from the ceiling offer another source of illumination. During practice, several water bottles decorate the hockey boxes in the rink. Lining the window towards the front of the rink are a row of Synchroettes banners, a red S decorated with ice skates and printed on a pristine white background. Surrounding the rink are rows of yellow, blue, and green seats where audiences can sit and watch events such as hockey games. Endo attends group practices three days a week with her team and attends private lessons twice to practice her own skills. She also attends numerous added team practices before competitions. On Saturdays, practice begins as 5:30 a.m. sharp, which for Endo means waking up at 4:30 in the morning and napping in the car during the 30 minute drive to the rink. Practices are usually two to three hours long, involving time both on and off the ice. The team also meets with its choreographer at least once a week. A typical practice on weekdays begins in the afternoon and runs late into the evening. The skaters begin with a warmup and practice individual skills such as edges and then move to synchronization. Then, they run through their programs. The team has both a long program and a short program which it performs at competitions. A short program is two minutes and 50 seconds while a long program is four minutes. The Team USA locker room located behind Rink 1 is the meeting place of the Synchroettes before and after each practice. With a sloped ceiling, each red cubby is marked with a name tag decorated with the Synchroettes logo, and an assortment of items unique to every team member. A peek into a typical cubby spots a welcome poster (made by previous members of the team for each new member), inspirational quotes, team information packets, mirrors, and most importantly — extra food. Similar to club sports such as hockey, being part of a synchronized skating team involves a lot of travel. The team participates in a total of eleven competitions per season. According to Endo’s mother, Keiko Endo, “The team travels mostly to New England November through January for local competitions, then Eastern in Lake Placid, NY or Hershey, PA in end of January.” Each year, they also travel to one of several possible venues for nationals at the end of February. 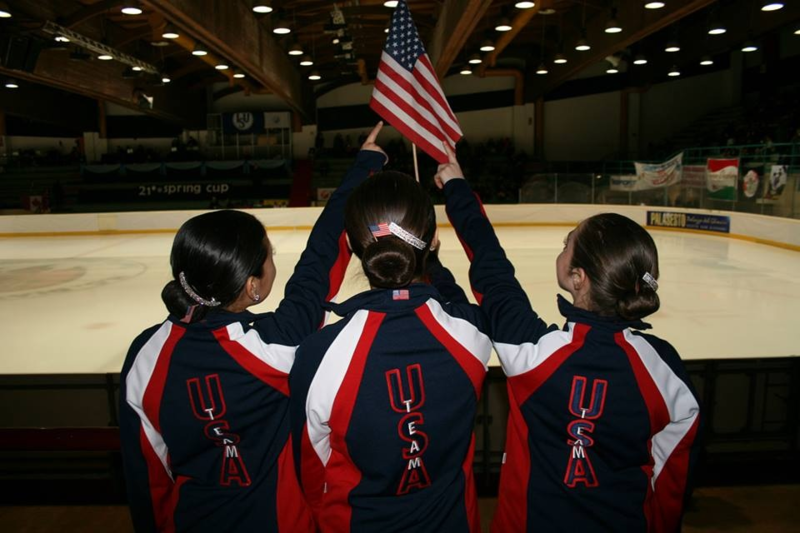 As a Team USA synchronized skating team, they are required to travel abroad every year for an international competition. This year, Endo’s team traveled to Milan, Italy for five days to compete in the Spring Cup from Feb. 12 to 15. During competitions, Endo plays an important role on the team. Her junior synchronized skating team consists of twenty people, but only sixteen skate during one program. Since this is Endo’s first year on the junior team, she has the job of being a spot sharer for the long program. This means that if anyone is sick, injured, or cannot make it to a competition, Endo skates in their spot. “Most people only know their one spot but I know six different spots, so that is intense,” she said. 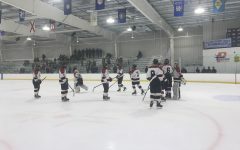 A typical competition lasts three to four days and involves leaving either on Thursday or Friday in order to attend the official team practice beforehand. A bus is responsible for transporting all of the skaters, coaches, and chaperones. Parents are allowed to come but they are not permitted on the bus. Besides the actual competition, the Synchroettes also follow a unique, superstitious pre-competition routine every time. On competition day, the girls wake up, get dressed, and go to official practice. The judges watch this practice to obtain a preview of the program. Following this they return to the hotel to catch a nap. After lunch it’s time to get dressed and do make-up. Each member has a practice dress worn at practices and at competitions, as well as separate dresses for the long and short programs. The team gathers to run through the program once more off ice and watch the video from the morning’s official practice. They warm up by running and stretching, usually standing next to specific people. In the locker room they tie their skates, again sitting next to specific people and listening to the same three songs every time. Lastly when everyone is ready the girls stand in a circle and link arms. As the music plays in the background, they close their eyes and visualize the best possible performance. Then, it’s time to compete! At each competition, the Synchroettes compete both short and long programs, usually on different days. Therefore, at each competition, the team goes through this routine twice. 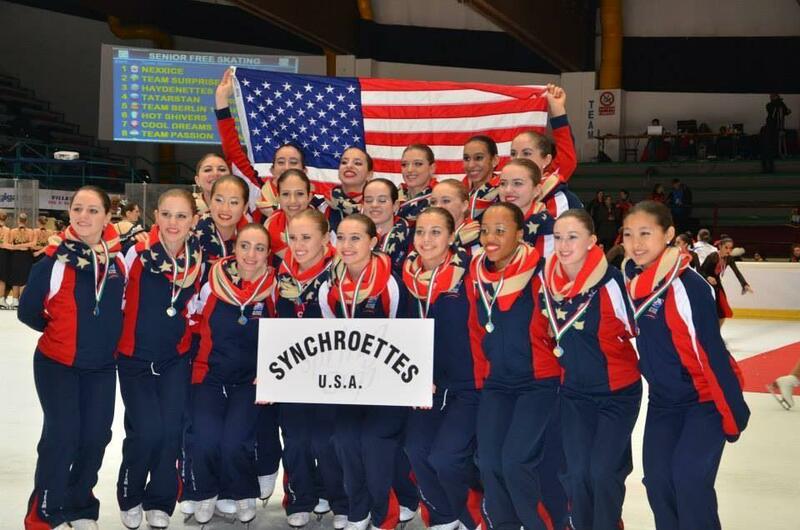 The Synchroettes Junior team competed in the 2015 Spring Cup in Milan, Italy representing the United States. 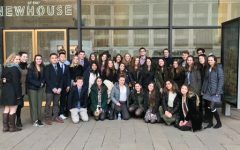 By a twist of fate, Elana Resnick, Endo’s physics teacher had the opportunity to see her most recent competition in Italy. Resnick was going to be visiting her younger brother who attends Milan’s Politecnico engineering school over President’s Day weekend. When Endo told her that she would be traveling for a competition, Resnick realized that they would both be in Italy over break and decided to go see Endo compete. 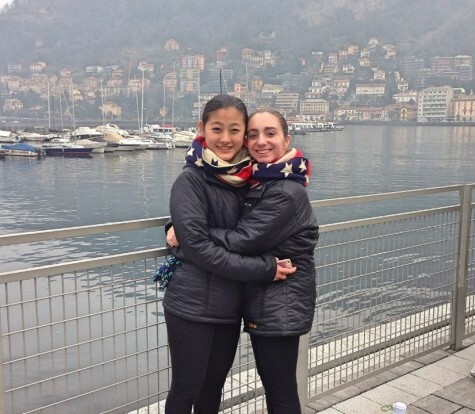 Resnick and her best friend took a train to the Palasesto-Palazzo Del Ghiaccio Di Sesto San Giovanni to see Endo and her teammates compete at the 2015 Spring Cup, an annual international synchronized skating competition comprising 32 teams, among the best in the world. 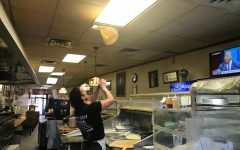 Resnick described the venue as being “very Italian” with many people from several different countries gathered to watch the competition. 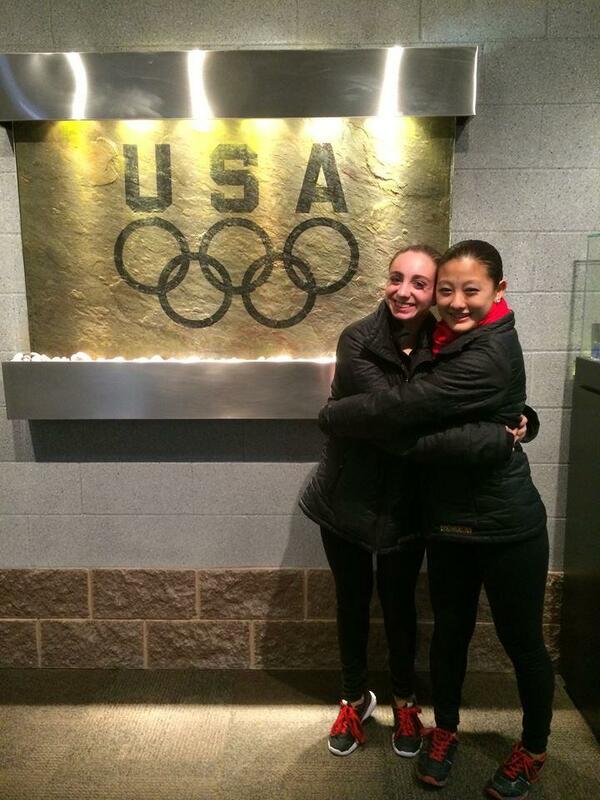 During the three hours that they were there, Resnick and her friend watched the juniors long program and were continuously impressed by the performances. But, since Endo is a spot sharer in the long program, she did not perform on that day. “We thought that the first team did a really good job and then we thought we were blown out of the water by the second team, then we thought that we were blown out of the water by the third team, and then they just kept on getting better and better and better. And the scores kept on getting higher and higher and higher,” Resnick said. This is the first synchronized skating competition that Resnick has attended. Although not knowing anything about how the scoring worked or anything about the technical aspect of synchronized skating, she said she had a great time. While competitions are rewarding and exciting, time management and any incomplete homework or tests are never far from anyone’s mind. Ayano and best friend Becky Barber touring Milan, Italy during their visit for the 2015 Spring Cup. 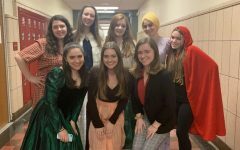 “Keeping up is difficult, but we motivate each other to do homework at competitions. 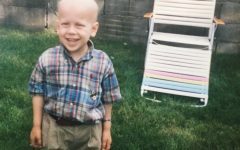 When we get home, we try to be extremely efficient in order to finish our homework,” said Becky Barber, Endo’s best friend and longtime teammate. Endo is described by Barber as being “bright, intelligent, and hardworking.” As a sophomore, she takes both math and science courses above her grade level. How she is able to balance both parts of her life is something that can only be described as remarkable. With her work ethic and the help of her tutors, Endo keeps on top of all of her classes even when she has to miss school to attend competitions. She can often be found at her desk studying and reading until 2 to 3 in the morning. Endo describes her room as “very small” but “cozy.” Flower prints adorn the lime green walls. Her bed, which takes up most of the space, is covered with a matching bedspread, and various stuffed animals from skater gifts, such as congratulations bears, line her covers. Directly next to the bed is a white desk with a lamp, a laptop, and an assortment of other necessities. A huge office chair offers a nice comfy seat for reading or studying. On the other side of the room are a set of brown cabinets, closets, and a bookshelf filled with rows of books. Not to be missed are the row of trophies and medals that sit atop the cabinets. Without an overhead light, two windows near the far side of the room along with a few lamps provide all of the lighting, giving the room a warm glow. All this is affectionately termed as an “organized mess” by Endo. “She always impresses me with her work and her work ethic. 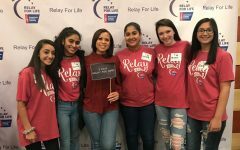 For her to accomplish everything that she does outside of school and still keep up with her schoolwork, even more than students that don’t do what she does, is incredible,” Resnick said. Endo’s mom e-mailed all of her teachers in the beginning of the school year to let them know about her schedule and future absences.With a busy travel schedule, Endo arranges with her teachers to take tests or quizzes either before she leaves or after she comes back. Even when she is away at competitions, she shows dedication to balancing both ice skating and academics. “She does not really need to catch up. She has nothing to catch up on. She has all of her work done on time when she comes back which is great,” Resnick said. Endo demonstrates persistence and dedication not only in school, but also out in the ice. Becky Barber has known Endo for three years. They not only skate on the same team, but are also best friends. Even though they skated on the same team during the 2012-2013 season, they became good friends the following year during tryouts when they were required to work together and choreograph a skating program. Barbers first impression of Endo was of her being quiet and reserved. Though after getting to know her better, this quickly changed. Nicola Fornino has only known Endo for two years, becoming closer friends with her only recently. Even so, Endo’s dedication to ice skating and her studies is apparent. Endo has worked extremely hard and invested much time into ice skating to make her way up to where she is now. Both in class and on the ice, she takes any challenges in stride and motivates herself to achieve her goals. One of her toughest challenges came to her when she was only in elementary school. In April, 2010 Endo, who was then in fifth grade, fell during a morning practice and fractured the growth plate in her left ankle. “I was doing a morning session so I was probably half asleep. I almost fell backwards so I stuck my blade into the ice (which is a very bad thing to do by the ways) and I twisted and fell over it which is how I broke it,” she said. Ayano and best friend Becky Barber at the Olympic Training Center during the 2015 Eastern Sectional Championships in Lake Placid, NY. Her doctor told her that she would be out for two months. After having a hard cast for two months, an X-ray revealed another fracture that had not been previously detected. After another two months, an air cast, and a brace, Endo began rehab and taking the first steps to getting back on the ice. “I definitely did a lot of exercises in rehab that helped me get back to skating. I lost a lot of muscle in my left leg. My right leg got so much stronger because I was relying on that. So I slowly got back on the ice and started practicing again,” she said. Even through this tough break, Endo never had any intention of giving up on figure skating. “I definitely knew that I was going to come back. It was a pretty long break but I got back,” she said. Even now, Endo continues to persevere in her challenges on the ice.The spread eagle is a freestyle move used often in figure skating that Endo as well as many others often struggle to hold on the ice. It is performed with the skater turning their feet out to the side and transferring their center of balance to the circle behind them. However, despite her trouble, Endo refuses to give up – she fights through the move each time she executes it. “You can be sure you won’t be finding her falling out of her spread eagle!” said Barber. When she is not ice skating, Endo can be found teaching or pursuing other interests such as golf and organizing events with her Girl Scout troop. Endo works part-time at the Ice Vault coaching group lessons. She started in December 2014 adding another activity to her busy schedule. “ My boss who is also a coach was at my rink and I saw her every week. She saw me skate and she wanted me to coach, so she asked her boss if she could hire me,” said Endo. On Mondays she teaches either 4:15 or 4:45 group lessons. On Thursdays and Saturdays she has a specific time. In general Endo teaches the basics of figure skating and occasionally also the tots group with children from the ages 3-7. “Tots are rough but since they have a lot of tots they need a lot of helpers,” said Endo. Endo is also a member of the girls’ varsity golf team. She first started playing golf in summer camp. “My family is really into golf so they always take me along. I love playing with the family. I’m not a beginner but I’m not good. If I hit it well I can it is pretty far but only if I hit it well…” said Endo. She recently attended her first practice and plans on continuing for the next few years. 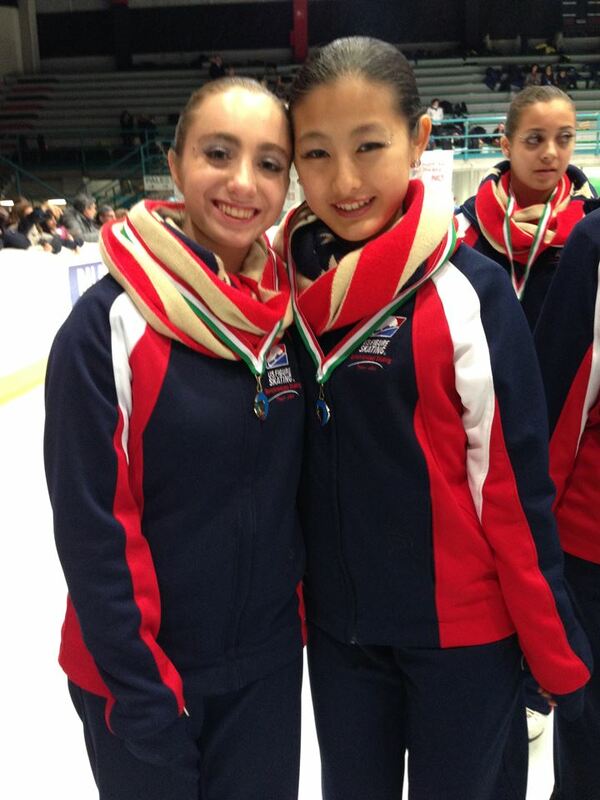 Ayano and Becky attend the awards ceremony for the 2015 Spring Cup in Milan, Italy. Endo has also been a dedicated member of her girl scout troop since second grade, moving up through the ranks. This year she is starting to work on her Gold award, the highest achievement in Girl Scouting. It challenges the organizer to make a lasting difference in their community by sharing their ideas and making a change.For her Gold Award Endo is working with a camp for people with disabilities and planning a cultural festival. Her goal is to bring the world to them. Through all these years, Keiko Endo, Ayano’s mother has played a crucial role in the background to allow Ayano to continue to pursue what she loves. Being a mom of a Team USA skater involves time commitment, expenses, and emotional support. For six years Ayano’s mom attended all of her competitions and was a team mom for the 2013-2014 season. A team mom functions as the caretaker and chaperone of the team. They make sure all the skaters are there and that everyone is fed and taken care of. 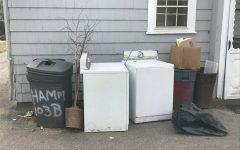 They also carry the dresses, snack bag, and attend to everyone’s needs. Since there are twenty people on the team and the coaches can’t always be there team moms play a very important role. After Endo broke her ankle growth plate in fifth grade, her mother was nervous about having her jumping again. Since synchronized skating requires very little jumping, for four years Endo stopped working on jumps.She just started practicing them again this February. Synchronized skating gives many skaters to an opportunity to continue to skate even in high school and college. In April, the International Olympic Committee will vote to nominate Synchronized skating as an Olympic event. “Please keep fingers crossed for us, you may be able to watch Synchronized skating in 2018 Winter Olympics in South Korea!” said Keiko Endo. As for the future, Endo said the figure skating is something where she works hard and has fun but would not be interested in pursuing professionally. Next year she will have to make the difficult decision of whether she will continue skating. “I don’t know if I’m continuing next year because it is my junior year and it’s going to be a little too intense. I’m considering not going back,”said Endo. Even so, Endo will continue to be a part of the team that she considers a family. Hi Laura, it was a very nice article, very much in details, thanks again, if there is a printed paper, can you give it to Ayano? This special feature will only be available online.